The Romance Dish: Mighty Lights! Hi, Anna! No, I have not had the pleasure of reading NORTHERN LIGHTS yet. I do love Nora's books, but don't really have a favorite. I love them one and all. Yes, I have been to Alaska! My parents, brother, and I went to Alaska, pulling a big trailer behind us. The Alaskan Highway at that time was full of boulders and large and small rocks, and we ended up with a broken windshield. On the 4th of July, my mom, brother, and I were taking a hike in the Bush, and a sled dog came running out of the bush and sunk his teeth into my leg. I ended up having to get a shot at the hospital, although at that time (way back in the dark ages) they weren't worried about rabies. Alaska is a beautiful state with lots to offer. I would love to go back some day. Hi Cathy! Oh, give Northern Lights a try. I think you'll like it, especially if you've been to Alaska. What a wonderful/scary/exciting trip! At least you got some great stories out of it! PJ, I had to laugh when I read it and then Cathy said she wanted to go back! I have not read Nora's Northern Lights. I do own it but it is buried in my TBR pile. I do enjoy books set in Alaska but I've never visited. My daughter went to Alaska three years ago. I have a beautiful picture of Denali National Park's Mt McKinley. Her S-I-L lives in Anchorage. She hiked , saw grizzly bear, saw a moose, went fishing in the cold water near Homer, saw whales, saw a glacier... They were there for 10 days. She loved the huge flowers but had a hard time getting used to the long days and people cutting their lawns at 10 pm. She stated how her husband and two guys went hiking and they were stalked by a couple of moose. It was quite scary. They said that moose kill more people than any other animal up there! Favorite book by Nora I loved her "Night" series especially NIGHTSHADE Thea and Colt's story. I enjoyed her wedding quartet series which started with Vision In White. I also loved her Chesapeake series especially SEASWEPT with Cameron Quinn yaking care of young Seth. Sounds like your daughter had a wonderful adventure, Laurie. We hear about bear attacks all the time but not much about moose. That's good to know! I love the Chesapeake quartet too. Cam is one of my all-time favorite Nora heroes. Laurie, Alaska sounds fabulous. A friend of mine did a couple of months there including going right out to the Aleutians where she saw polar bears and Kodiak bears. Amazing stuff! I remember being in Finland in late spring and it was light most of the night - very odd! I've read the Chesapeake books and just loved them. Think they're still my faves of hers. I haven't read the others you mention - clearly I need to ADD to my TBR pile. Bought the Witness a week or so ago - there was an excerpt at the back of The Dark Witch which was very intriguing. Clearly another option for a review here! I have read just about all of Nora Roberts books including Norther Lights. I like the cold too but not sure I like it enough to go to Alaska. My favorite of Nora's books is the Sister Island Trilogy, right now I am re-reading The Gallaghers of Ardmore Trilogy, Jewels of the Sun, Tears of the Moon, and Heart of the Sea. They are set in Ireland, a place I have always wanted to visit. I think I'd like to visit Alaska in the summer. It would still be cold but not sooooo cold. Nora's Irish books are among my favorites. Her newest, Dark Witch is set in Ireland and kicks off her new trilogy. I loved it! Dianna, I loved that Gallagher trilogy, especially the first one. I read Dark Witch and really liked it too. Got the second one on order already. I think my fave Nora books are the Chesapeake Quartet. PJ, I particularly loved the romance in The Dark Witch. I think she does that nice people falling in love trope so beautifully! I just started reading Nora Roberts last year (I know lol). Oh, but, Catslady, think of the back list! You'll be enjoying her books for years to come! Catslady, actually it's wonderful coming across an author you love and finding out they've got so many books for you to read. I still have LOTS of Noras to catch up on. I've read most of Nora's books - from her early lighter romances to her romantic suspense like Northern Lights. My favorite is her Bride Quartet - 4 books about 4 friends who start a Wedding business and find their own romances along the way. For 2014 I'm going to start reading her JD Robb stories. I haven't been to Alaska yet, but I hope to go someday. Di, I loved the covers of those bride books. I haven't read them though. Sounds like I should! I'd love to do a cruise (in summer!) in Alaska! Hellie, if you enjoyed her Sisters trilogy, give her new book, Dark Witch a try. It's set in Ireland but the heroine is American. I liked it a lot. Ha ha, Hellion! And by the way, welcome to the best party venue in town! Looking forward to reading your reviews. Loved your take on The Rosie Project. Seriously thinking of buying that one - it's had so much buzz. He's an Aussie, did you know? I reviewed the Sisters books here not long ago. I'll see if I can find a link. Northern Lights was made into a movie for American TV about 10 years ago. Perhaps you can find it on Netflix or one of the other movie-streaming services. I had read the book before the movie came out, and I thought the movie people did a good job capturing the essence of the story. Thanks, Susan! I had forgotten about the TV movie. Actually, Susan, I can see it would make a good movie - the crime plot would give it a really strong narrative structure. I think it pops up occasionally on cable here. I'll have to keep an eye out for it. Thanks for the recommendation! Hope, thanks so much for saying you love the books! I'm looking forward to the day when I've got a backlist as long as Nora's! I loved the Gallagher books. I think they might actually have been my first Noras. I'll check out the Born In trilogy - try Dark Witch. If you like the Irish stuff, that should be right up your alley. Ha ha, Nancy! Cable TV - the source of so much guilty pleasure. I'm a Judge Judy fan - shh, don't tell anyone! I love cold, windswept places so Alaska looks right up my alley, but I have to say, I'd go in the summer! Thanks for recommending this book to me - it's actually thanks to you that I drew it out of the huge TBR pile! I need to check out NatGeo's offerings more often. Sorry I've been AWOL, guys! Something weird with the internet this morning and I couldn't load the site until now. Fingers crossed I'm here to stay now. Thanks so much to you all for swinging by! Although I have not read this particular book of Nora Roberts, I do have to say that the plot is very intriguing. Every time I encounter that question, I can never come up with a favorite one of hers. I love books. Period. Connie, this one's a really good one. Try and grab it! Ha ha, hear you on loving books. That's how I got into this TBR pile mess in the first place! I hear you, Connie. So many great books. It's almost an impossible task to choose only one. 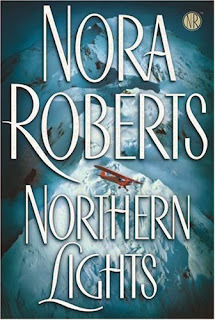 I haven't read Dark Witch yet, but I have read Northern Lights and most of Nora Roberts's other 200+ books. I can't even choose a favorite NR series; forget about a favorite book. My favorite Nora series include the Quinn Brothers quartet, the Concannon sisters trilogy, the MacKades, the Stanislaskis, and all the MacGregor books. Favorite single titles are Carnal Innocence and Three Fates. But there are many others that are also on my keeper shelves. Ooh, Janga, taking notes. I've still got a LOT of Nora's books to cover. And she's so prolific so she keeps adding to the list! I really liked Dark Witch - lovely romance! You've named a lot of my favorites, Janga. Do give Dark Witch a try. Like Anna, I liked it a lot. I haven't read any of Nora's books in several years. So many authors so little time to read. Will have to look for this one. Quilt Lady, I've been on a bit of a mystery kick lately so all the police procedural stuff in this one suited me down to the ground. There just aren't enough hours to read all of them, Quilt Lady. Northern Lights is on my bookcase unread to date. It looks too daunting. I am more of a romance lover, not so much murder mystery, so not sure if I will like this one. I have a lot of Nora favorites.Vision in White is a really great one that I have read a few times. The Dream Trilogy is really good, and so are The MacCade Brothers & Born In series. Another favorite is Song of the West. Sharlene, there's plenty of romance in this one, including a couple of lovely secondary romances. Give it a go. Nate's a great hero and Meg gives him a run for his money! Thanks, guys, for a really interesting discussion. As always when I do a review here, I've got some great books to add to the TBR pile. Join me on 24th Feb when I'm doing a Harlequin roundup! Yeeha! I have read this book, and it was many years ago when it first came out.. I never miss an Nora Roberts books. I have been reading her from way, way back when she was writing Harlequin romances. I have never had any read desire to visit Alaska, I guess because I am not an outdoor person. I don't hike or fish or things like that. But a few of my friends have gone on boat cruises to Alaska and enjoyed it.. Maybe one day..
Kathleen, I must say my ideal travel to Alaska would involve a medium-size cruise boat and cocktails on the balcony as I watched all that scenery go past. So glad you enjoyed this book! I haven't yet read NORTHERN LIGHTS. It is among many by Nora Roberts that are in my TBR Mountain (she has her own shelf) or on my Wish List. My whole house has turned into a giant TBR pile. It is so hard to keep up with all the good books coming our and all the good older ones I am hearing about. With the weather as hot and dry as it is down your way, I am sure a story set in the Alaskan winter gave a bit of relief. Thanks for the review. Now I must go dig through my shelf or make a trip to the library.